By now, you may have seen that the Centers for Medicare & Medicaid Services (CMS) has released a final rule(qpp.cms.gov) that implements the Medicare Quality Payment Program (QPP) called for in the Medicare Access and CHIP Reauthorization Act of 2015 (MACRA). Most of this regulation is final and effective Jan. 1, but CMS seeks comments on some sections. 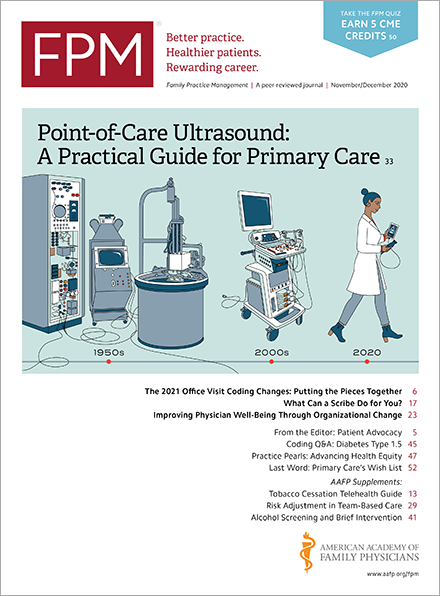 • Eligible clinicians only need to score three points and report as little as one measure to avoid a negative payment adjustment in 2019. Eligible clinicians who achieve a final score of 70 or higher will be eligible for the exceptional performance adjustment, funded from a pool of $500 million. • Eligible clinicians only need to report for a minimum of 90 consecutive days in 2017 to be potentially eligible for a small upward payment adjustment in 2019, which means you can start reporting as late as Oct. 2, 2017. • CMS is decreasing the number of measures eligible clinicians must report. • CMS estimates that more than 90 percent of eligible clinicians will receive a positive or neutral payment adjustment in 2019. Although CMS is still not offering small practices a “virtual group” option under MIPS, there was good news for these physicians. For instance, CMS is excluding more small practices from being subject to MIPS by raising the “low-volume threshold” for exclusion to be $30,000 or less in Medicare Part B allowed charges and 100 or fewer Medicare patients. CMS also estimates that at least 80 percent of solo practices and groups with nine or fewer clinicians will receive either a positive or no MIPS payment adjustment in 2019. To accompany the final rule and provide more information, CMS also launched a new QPP website(qpp.cms.gov) and issued an executive summary(qpp.cms.gov), press release(www.hhs.gov), blog post(blog.cms.gov) from Acting CMS Administrator Andy Slavitt, and fact sheet(qpp.cms.gov) about the regulation. A family medicine perspective on the final rule is also available.